The Rogue topic this month was March Madness, and here we are nearly midway through April. Still, after reading Robin’s post about Mad, Mad, March, the writer in me decided this madness in March required some investigating. If you look up mad in the dictionary, you’ll find several different meanings. There’s mad as in angry, furious, irate, raging. There’s mad as in very enthusiastic about someone or something. And then there’s the original definition, which appears first in the Merriam-Webster dictionary, to be mad as in mentally ill or insane. Hmmmm. Working backwards, today’s March Madness is all about college basketball. It began in 1939 with the Illinois High School Association when Henry V. Porter wrote an article entitled “March Madness” for the organization’s in-house magazine. Its madness has evolved. But where did the term actually originate? From what I find, it propagated from hares. To be as “mad as a March hare” is an English phrase, derived from the observed antics of the European hare during their breeding season which goes on for several months in the Spring. Hares consistently display odd behavior—boxing, jumping, etc., etc. The first recorded mention of the hares’ madness appears to be circa 1500, in a poem called “Blowbol’s Test.” Thanne [th]ey begyn to swere and to stare, And be as braynles as a Marshe hare. The first citation using the phrase in the form we know was in 1959 in Sir Thomas More's “The supplycacyon of soulys.” As mad not as a march hare, but as a madde dogge. The term “hare brained” refers to the same behavior, and was first referenced in Edward Hall’s Chronicle, 1548. "My desire is that none of you be so unadvised or harebrained as to..." And of course Lewis Carroll took it a step further in his 1865 novel, ALICE’S ADVENTURES IN WONDERLAND, by creating the iconic March Hare. Where I grew up, March Madness equated with cabin fever. Statistically, in Colorado, March is the snowiest month and spring comes 30 days (sometimes 60 days) late. Although, come to think of it, this year March was pretty darn nice, and I’m sure I saw a rabbit hopping around like mad last night when I was walking the dogge. This Spring, there is lots of madness happening with the Rogues. Last month we bid farewell to Sonja and welcomed Robin Burcell. This month we bid adieu to Francine Mathews and welcome Lisa Black. The changes are bittersweet and exciting. Francine leaves us as her career takes a turn, and she focuses on a new direction. Her twenty-seventh novel is straight historical fiction. THAT CHURCHILL WOMAN, tells the story of Jennie Jerome, Winston Churchill’s American-born mother, and is scheduled for publication next Spring. Bringing elegance, reason and expertise to the Rogue Women Writers, Francine shared personal stories of her life—summers on Cape Cod, a heart-wrenching accounting of her father’s death from a heart attack her freshman year of high school. She educated us on interesting figures and events in history. She regaled us with stories of her four-years in the CIA—investigating the bombing of Pan Am Flight 103, over Lockerbie, Scotland and sleeping on a horsehair mattress in a Spectre-era casino in the middle of Bratislava. We can’t thank her enough for all the time and energy she gave to the Rogues. Francine, we are going to miss you, but we’re also very excited to see where your new endeavor takes you. We wish you all the best with your upcoming novel and can only hope someday you’ll tackle another thriller and come back to blog with the Rogues. And, we are DELIGHTED to welcome Lisa Black as our newest Rogue Woman. Lisa has spent over twenty years in forensic science, first at the coroner’s office in Cleveland Ohio and recently as a certified latent print examiner and CSI at a Florida police department. Her books have been translated into six languages, with one reaching the NYT Bestseller’s list and one being optioned for film. Now, with twelve books under her belt, the fourth book in her Gardiner & Renner series, Suffer the Children, comes out in August. We’re excited Lisa has signed on and look forward to getting to know her better. Her first blog will post on June 3rd. Please join us in saying farewell to Francine and hello to Lisa, and share your comments and thoughts. Nicely done, Chris. I always assumed that March Madness referred to basketball - and it's fascinating to realize how much lies behind that phrase. I join in the sadness of saying farewell to a fabulous Rogue and great writer and a big welcome to our newest member, the talented Lisa Black. Where sayings, phrases and terms come from always fascinates me. Plus it allows me to procrastinate by doing research. I absolutely want to say a fond farewell to Francine....I have learned so much from her posts along with her terrific thrillers inspired in part by her great experience serving in our CIA. 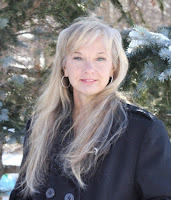 As for Lisa Black, she is a talented author, also with unique experiences to share. She will bring a unique perspective to our Rogue posts here -- can't wait to read her next thriller! I love all that research about hare brained, Chris. What a rich history our language has, and this is a perfect example. Gosh, I'm going to miss Francine, too. And I'm truly excited that Lisa is joining us! Thank you so much for the warm welcome! I am so honored to be here. And Chris I am a huge Alice in Wonderland fan. I had to read the original in college (for a mathematics course—don’t ask!) and loved it. I can recite most of the Mad Tea Party scene from memory. Okay, I can't not ask--how the heck does Alice in Wonderland pertain to math? As I recall it was the examples of logic. As when the Cheshire cat says, "In that direction," waving his right paw round, "lives a hatter. 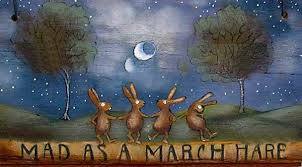 And in that direction," waving the other paw, "lives a March Hare. Visit either you like. They're both mad." "But I don't want to go among mad people!" Alice said. "Oh, you can't help that. We're all mad here. I'm mad. You're mad." "How do you know I'm mad?" asked Alice. But, my teacher pointed out, Alice was incorrect, as the argument was completely logical. All A are B. If you are A, then you must be B. *I was not kidding about having large portions memorized. I can go on at some length like this, but then people inevitably begin to fidget and check their watches. Bidding adieu to Francine--and best wishes for THAT CHURCHILL WOMAN. And hello to Lisa! Looking forward to your debut on Rogues. Chris, at the risk of sounding like I know nothing about sports, I must confess that this year was the first that I paid any attention to March Madness being related to basketball. 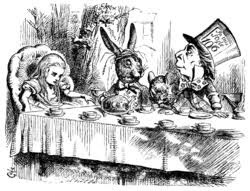 I'm sure I've heard my husband mention it before (he's a sports fanatic) but I had always assumed that March Madness was stolen from somewhere (like Alice in Wonderland, March Hare being mad and all) and simply used for basketball in March. I didn't know it was a thing! Sigh... Don't tell my husband. He'll simply laugh at me. Two ends of the spectrum here--one who knew the term only because of basketball and one who had the term in it's original context. I find it interesting how our language has been altered by time.